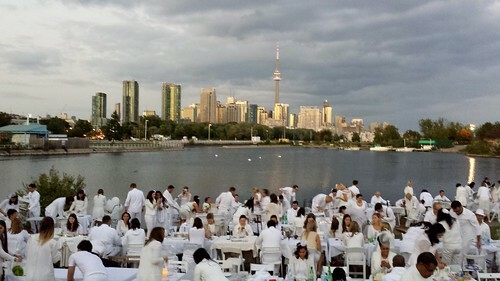 This year’s Dîner En Blanc Toronto was magical. I thoroughly enjoyed the fabulous location at Ontario Place waterfront. The live entertainment of ballet dancers and painting were classy. The DJ and band put the crowd into a festive mood. 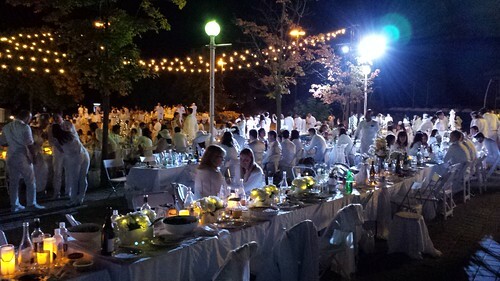 I was so happy to be a part of this experience, to share a special evening with 1400 revellers in elegant white outfits. From last year’s experience, my friends and I decided that group of four was the optimal set up. Each of us was in charge of one course of the menu so our preparation was streamlined. Last year I made main course for my group but this year I enthusiastically volunteered to prepare dessert. I had the crazy idea to make a croquembouche from scratch and bring it to the secret event location. I am always up for a good culinary challenge. 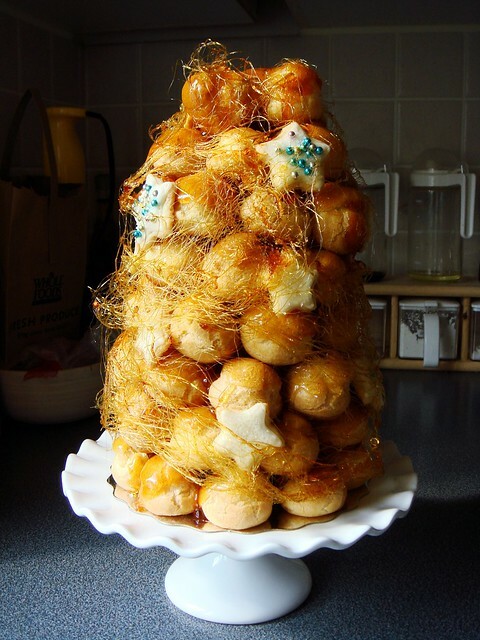 Why my fascination with croquembouche? This traditional French dessert is typically served at big celebrations such as weddings or birthdays. The tower of caramel-glazed custard-filled cream puffs is held together solely with caramel and garnished flamboyantly with filigree of spun sugar. So what if it is complicated to make and delicate to transport? Surely I could overcome such, umm trivial, details. I wanted a croquembouche on our table and that was that. Baking a successful pie makes me feel accomplished like nothing else can. By that logic, baking ten little successful tarts ought to multiply my sense of accomplishment ten fold, right? Last weekend, I had the pleasure of experiencing both. I don’t know if I really felt ten times prouder of my effort. What I know for sure, sharing homemade pies and tarts certainly made many of my friends and family happy! Let’s face it, Canadian cuisine does not have a strong identity. The few dishes that we can say are uniquely Canadian, we are fiercely proud and protective about them. 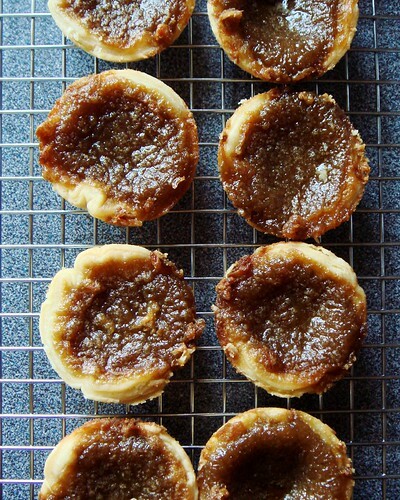 If you want to start a lively argument at any Canadian parties, I suggest you declare loudly “a real butter tart ought to be…” and watch the feathers fly. As a avid baker, I am amused that I had not try baking butter tarts at home until last weekend. And it was only an afterthought to use up some leftover pie dough from making a wild blueberry pie. Before I get to the butter tarts, let me first tell you about the wild blueberry pie. 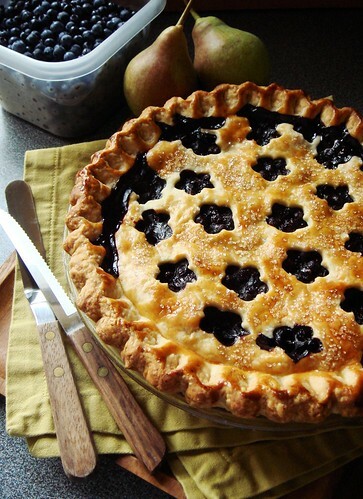 At my house, summer is not complete without one juicy and deeply flavourful wild blueberry pie. It is one of the few treats I bake that rarely leaves the house for a couple of reasons. First, it is a family favourite that Little Brother and I cannot get enough of. Secondly, it is so expensive to make that I just don’t feel generous enough to share except with close family and friends. This year, the shopping deity smiled upon me and I scored a tremendous deal at $30 for 3L basket. I was ecstatic. Two wild blueberry pies for one summer? That was almost too good to be true! 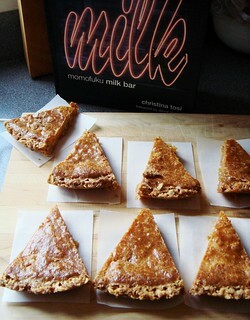 Last week I came across Momofuku’s tweet about a demo class with Milk Bar’s chef Christina Tosi in Toronto. Without any hesitation, I immediately reserved my spot and made plans with foodpr0n to attend the class together. I cannot say I am a huge fan since I only visited NYC’s midtown location in 2010 and my taste memory is fuzzy. That was the only time I tasted their signature Crack Pie and honestly I do not remember much about it among a whole weekend of feasting. However, I have long admired chef Tosi’s creativity. Her dessert challenges preconceived notions of North American style baking. Her flavour combinations are unexpected pairings of familiar tastes (cereal milk and compost cookie are both excellent examples). I jumped at the opportunity for a small group class with lots of chances to interact. The 90 minute demo covered the making of a crack pie from crust to filling with plenty of tips and tricks for crack pie success. I sat at front row steps away from the work bench. Of course I took plenty of photos along the way! Although a cookbook can describe every step in great detail, it cannot compare to seeing up close the consistency of the cookie batter, how the oat cookie crumb ought to hold together, the fluid motion of shaping the crust, and how to stir the filling without aerating it. Did I mention the class was fun? Chef Tosi and her assistant ran the demo like they were showing friends how to bake in their home kitchen. 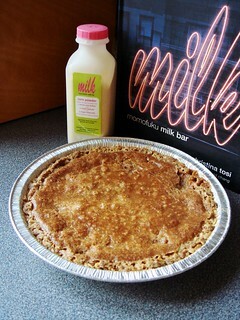 Their enthusiasm was infectious and I was excited to try my hand baking crack pie at home. Read on for plenty of photos from Sunday and find out how my own crack pies turned out. Cherry clafoutis ranks as one of my top 10 favourite desserts. 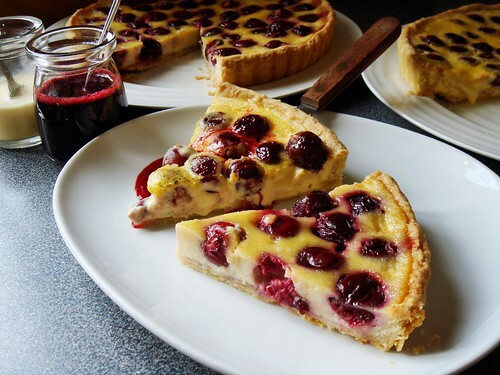 Set aside the fancy French name, you have the timeless combination of baked cherries and custard. It is a simple and comforting treat that I only get to indulge in summer. 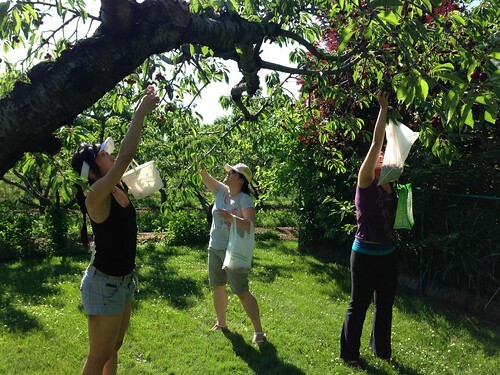 Last weekend my friends and I received a generous invitation to pick cherries for free at an acquaintance’s backyard in Niagara-on-the-Lake. The trees were laden with red orbs at the peak of the season. We filled our buckets to our hearts content. I came home with two large bags of sweet and sour cherries. I froze half of my haul and still had a large bag of sweet cherries for snacking. Not one to leave well enough alone, I decided make cherry clafoutis using my favourite recipe. I love the classic version with a bit of flour to lend structure to the delicate custard. 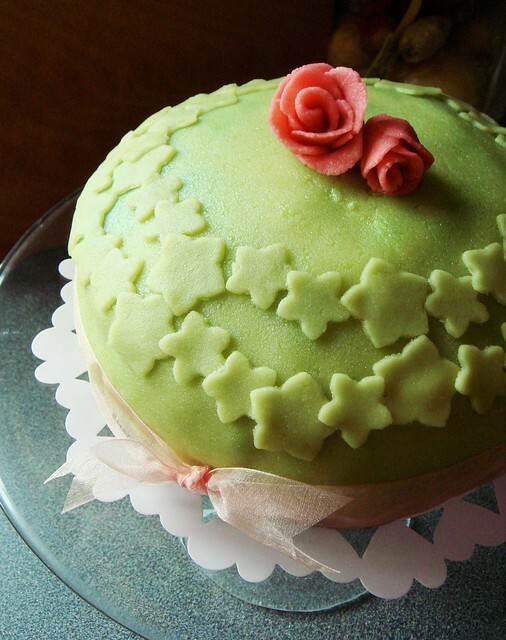 Last I made it, it was extra special with marzipan stuffed inside each pitted cherry. However, I always remember the ethereal version I sampled at Gerard Mulot’s patisserie in Paris. It is a bit unconventional with tart crust but I think it is a brilliant idea. With the support of the buttery crust, the flour-free crème fraîche custard can be all the more delicate. Lucky for me, I don’t have to travel to Paris to experience this treat. 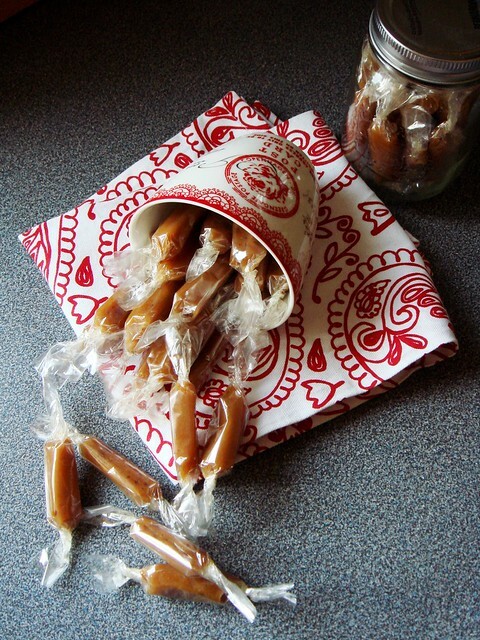 Dorie Greenspan got the recipe from chef Mulot and included in her cookbook Paris Sweets. I usually revisit this recipe once a year to celebrate cherry season. This year is no exception. I am very disciplined when it comes to store-bought chocolate bars but I can’t say no to Twix. Is it because of the combination of crunchy cookie, chewy caramel, and chocolate? Or perhaps the slender shape feels just civilized enough to take small bites? May be I like how each package comes in a pair so I can save one for later indulgence? Whatever the reason, it is one of my weaknesses and I deem it too dangerous to replicate at home. I cannot be trusted with a whole pile of Twix sitting conveniently within reach. Last week, I could resist no longer. The recipe from The Liddabit Sweets Cookbook was calling my name. It was not the first time I felt a strong urge to tackle this recipe. In all previous encounters, I just found the shortbread portion of the recipe too fussy. I am not a fan of chilling, rolling, and fitting delicate shortbread dough into a rectangular cake pan. The authors Jen King and Liz Gutman explained in detail how not any cookie recipe would work well in a chocolate bar. They warned that anything that crumbles too much and does not slice well is just asking for trouble. 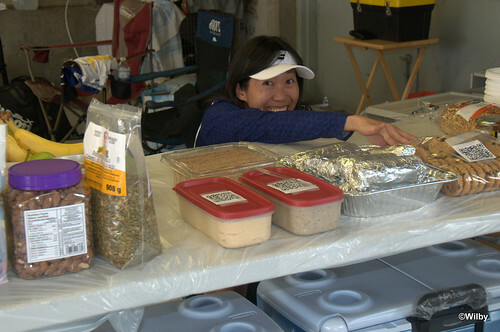 While I trust their experience, I baked my fair share of bar cookies and know which recipes work well for this purpose. The press-in-pan shortbread crust from kukla’s Lemon Ricotta Bars is easy to make, slices like a dream, and tastes amazing. 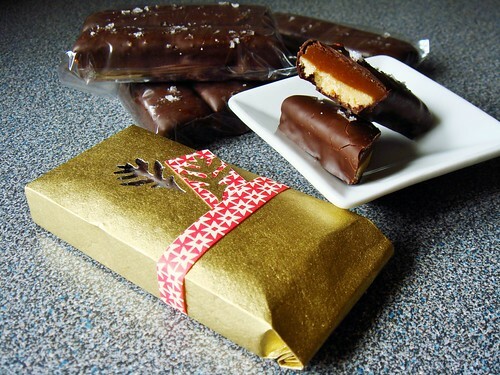 With that hurdle out of my way, I had no excuse to resist the charm of homemade Twix. I cannot stress the importance of having a simple yet impressive dessert in every cook’s repertoire. To celebrate Canada Day, I made a festive red and white Summer Berry Custard Tart bursting with local strawberries and raspberries. With its glistening crown of peak season berries, it is hard to miss at the dessert table. The crunchy cookie crust tastes buttery and cradles a fluffy bed of whipped custard. A well-made classic dessert never gets old when made with top-notch ingredients. 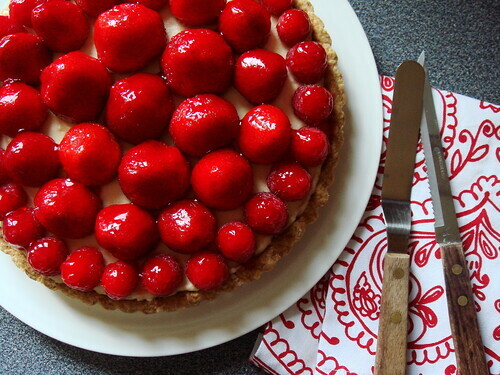 I brought this berry custard tart to a Canada Day backyard party to share among friends. 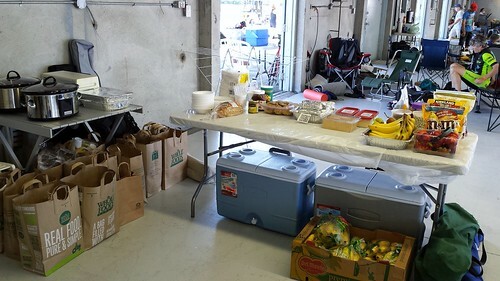 Between Nationals and Canada Day Marathon, it was the end of a long weekend of racing and we were all exhausted. We hacked the tart to approximate wedges with a butter knife and flopped the pieces willy nilly on plates. There was little regard to aesthetics. Even so, the tart tasted phenomenal. It was the balance of a classic dessert that highlighted the essence of summer. I really should make berry custard tarts more often. I discovered last weekend that bringing two dozens donuts to a party is one of my best potluck decisions ever. Not just any run-of-the-mill donuts from the corner cafe. Not even fancy gourmet donuts from the latest hipster donut shop. I’m talking about honest homemade French crullers and custard-filled yeast donuts that emerged from a pot of bubbly hot oil in my kitchen. Deep frying may be intimidating but the result far outweighs the effort. Since I bought my Thermapen digital thermometer, my confidence with deep frying soared. Knowing that I submerge my food in precise 350F hot oil makes sense because I can relate that to oven baking temperature. Discovering Japanese grease solidifier granules also eliminated one of my worries. Now I can safely dispose of spent cooking oil in one jellied disc along with other organic waste. As long as I do not stink up the house like a fast food joint, I have few reasons to avoid deep frying. Combined with my love of donuts, I sense a slippery slope in dietdom. My cooking friends and I share a penchant for themed cooking parties. 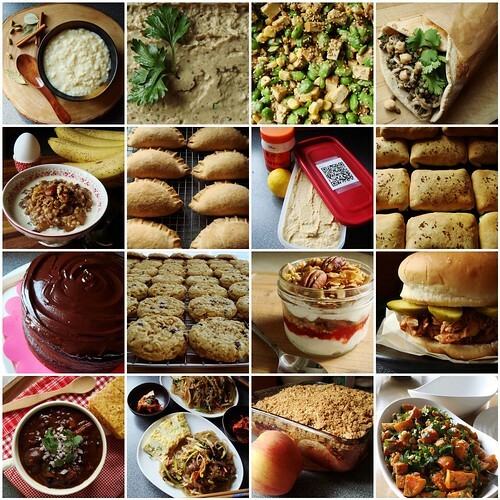 Pie Day, Cake Day, and Dumpling Day have become much-anticipated annual traditions. Last Saturday we had our inaugural Choux Day filled with cream puffs, éclairs, profiteroles, and gougères. 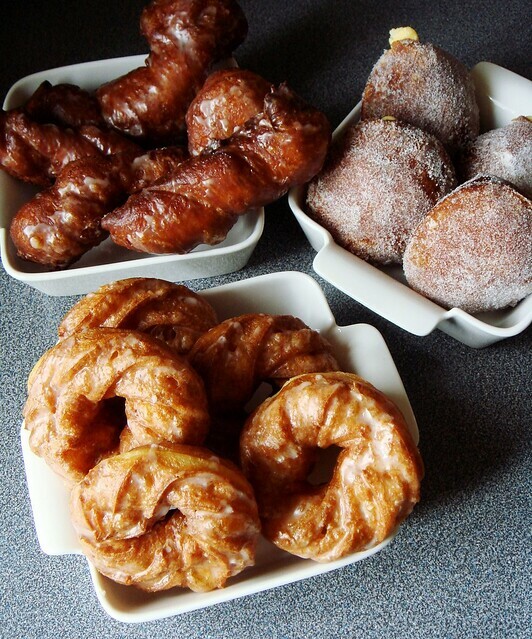 What do donuts have to do with choux pastry? My favourite donut, the impossibly airy French cruller, is in fact deep fried ring of pâte à choux. A dozen honey glazed French crullers was my contribution to Choux Day. But since I already had the whole deep frying set up at home, I extended its mileage by throwing in a dozen of yeast raised donuts for good measure. Because, why not?